When it comes to manual camera control, nobody does it quite like LG. LG’s G-series hasn’t always been a camera powerhouse, but LG is looking to change that with the G8 ThinQ. A new front-facing camera setup is the hallmark of the new camera setup, available in all regions and sporting not only a brand new, larger sensor than ever before, but also packing in an IR projector and a TOF camera. This sizable 1/3.6-inch 8-megapixel sensor sports 1.22-micron pixels and an f/1.7 lens, making this the largest sensor with the largest pixels and the lowest f-stop rating that LG has ever put into a smartphone. The results are striking, and it’s pretty clear that LG is right at the top of its game for best selfie cameras on the market. Couple this sensor upgrade with the new TOF camera right up front and you’ll see a significant improvement in portrait mode style shots, which are easily as good as the ones from the rear camera, if not better. This is most certainly a replacement for using that dual rear camera as a way to take great portrait shots, and LG’s processing on the G8 looks incredibly natural to boot. It’s essentially the clarity of the Pixel 3 without the extra heavy processing and low contrast, and it looks more realistic than the Galaxy S10+ as well, although some may prefer the way the S10+’s front-facing shots come out because of Samsung’s unique processing methods. LG has also added in some really interesting new studio lighting effects, which are mapped to your face in 3D space via that TOF camera. 6 options in total are available and will give you varying natural lighting looks. The exception are the two “stage lighting” options are about as unnatural looking as other phones that use this same effect, and in general it’s just not great looking. As we make our way into lower lighting conditions, the G8’s front-facing camera starts to falter. Details begin to get a little muddy, and even in moderately low light you’ll find using the portrait mode or studio mode are no longer able to be used thanks to software restrictions. Low light soft flash using the screen is decent, but it doesn’t help much in the way of replacing the details that were lost when the extra noise reduction kicked in. It’s a shame to see this one drop so quickly in quality in lower light, especially since it’s so good in every other kind of lighting condition. Also new to the scene is an updated camera UI, which takes the best from the V40’s camera UI and adds some fantastic new customization features. In what’s probably a first for me, the mode carousel design on the G8 is actually rather excellent, but not in the configuration that is set out of the box. This carousel can be completely customized, similar to Samsung’s, but the big difference is that all modes are included in a “more” section at the end of the list. As such, leaving only two or three modes in the carousel for quick access seems to be the best configuration, as the “more” button gives a quick one-button access to all modes, reachable with a single hand at all times. Trying to use it as a carousel, as many other phones have, isn’t good at all. The carousel doesn’t actually scroll like some other phones do, rather it’s a single swipe to move between individual modes, meaning if you want to get 3 modes over, you’ll need to swipe 3 times. Thankfully, you can only swipe on the carousel itself, not on the viewfinder, which is similar to Huawei’s design and means there won’t be any accidental mode switching. Editing modes is easy but not visually obvious. Just like on OnePlus’s camera UI, having a way to show a grid of all modes on one screen within thumbs reach is far superior to these nonsense other designs that only have a carousel, as it’s just easier and quicker to choose the mode you want without having to scroll through a bunch of junk. Another excellent design choice is the dedicated record and shutter buttons in every mode that supports video and photo taking. This takes the guesswork out of what modes support either of these tasks and lessens the time it takes to simply start recording a video or taking a picture. Other designs force you to switch to dedicated video or photo modes, which is annoying and takes more time than it should. Clicking to focus anywhere on the viewfinder will pull up a nice, large exposure slider. This is visually superior to most other camera UIs which either don’t give good visual cues for this functionality, or make those visual cues tiny on the screen. A small “MF” button will swap out this exposure slider for a manual focus one, complete with focus peaking, which highlights objects in a green outline when they’re in focus. This is the best automatic and manual functionality on the market, bar none. Nothing else even comes close to the ease and speed at which these settings can be adjusted. Not all software updates are great though, as is the case with the new video portrait mode. Designed to deliver a similar experience to picture portraits, with the background artificially blurred to make it look like there’s a shallow depth of field, this mode just seems to fail in every respect. Object detection is very poor, and even clicking on the person to track them doesn’t seem to help object detection at all. In general, the video is a seemingly random series of blurred sections that rarely coincide to where they should be when trying to accurately mimick the effect on an SLR-type camera. Thankfully the rest of the manual video experience is still the industry best, and as always you’ll find that both manual photo and video modes give you more control over the experience than any other OEM on the market. Shutter speeds in manual photo mode reach up to 30 seconds in length, and ISO in both manual photo and video modes tops off at 3200. This isn’t as high as Sony or Huawei allow, but the rest of the controls here help make up for that difference. The interface has also been tweaked just a tad bit, including quick exit buttons for going back to full auto mode. LG has also further integrated its manual camera app with Graphy, a sort of social sharing service for manual camera settings. A scrolling row across the bottom of the manual mode has easy-to-understand default options for things like dark streets, sunsets and other scenarios where you might want to take things into your own hands. Graphy makes it easy to understand what settings affect the picture quality and help even expert photographers make quick settings for various scenarios. On to video recording, quality is good overall but not quite as good as the Galaxy S10. Two areas where the G8 fall behind are in dynamic range and image stabilization. 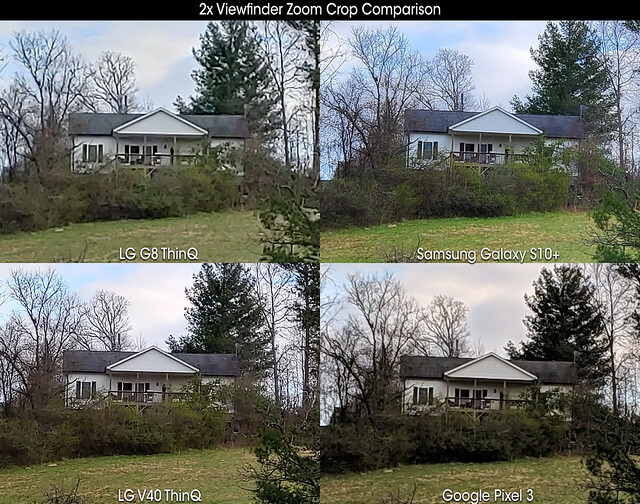 The Galaxy S10 has much better image stabilization at every resolution and framerate, and it has better dynamic range as well, although not quite by as wide of a margin as we see with image stabilization. When compared to the V40, it looks like LG has made some minor improvements to contrast, color and overall details, even at the top 4K60 quality. The G8’s strengths lie in its versatility, namely being able to record 4K60 with the wide angle camera as well as the standard angle one, and its ability to manually adjust all video parameters in that manual video mode. Graphy isn’t in manual video mode, unfortunately, so you’ll just have to learn in manual photo mode. Manual controls can’t be overstated, and it’s well worth noting that we film everything here on the Channel with LG phones. Specifically the V40 in this video’s case, but every bit as possible to have as much control over everything with the G8. Low light is solid and remains one of the better low light cameras for video on the market. Video in low light is bright, detailed and the software is not afraid to let a little noise into the frame in order to capture as much detail as possible. Concerning photo quality, we’re looking at basically identical performance to the V40 ThinQ in most situations. The biggest change will be for regions that don’t get a telephoto camera on their G8 models, as is the case here in the US. The lack of telephoto camera on some G8 models is going to make a substantial difference in the amount of detail that can be achieved when zooming into an object in the viewfinder. Why in the world LG is shipping some units without this third camera is bizarre, and it’s definitely a palpable difference in quality when comparing it to other phones. The V40 performance in these shots should be similar to what you can expect out of a G8 model with a third rear camera. During the day on auto mode, that main camera’s detail levels are similar to the Samsung Galaxy S10, but feature more accurate colors and lesser dynamic range. There’s a slight improvement over the V40’s processing in color accuracy, although it can trend a little warm sometimes. Low light is somewhat disappointing as there’s no longer a bright mode like the last few generations of LG phones had. Bright mode used pixel binning to virtually expand the size of the pixels, lowering the resolution but increasing the amount of light the sensor catches. The lack of pixel binning tech results in a darker picture but can sometimes result in a sharper image. The ultra-wide angle camera has improved dynamic range and contrast over what we saw on the V40. Colors are deeper as a result and overall it’s definitely an improvement, albeit a small one. Low light performance on the ultra-wide angle camera is essentially identical in auto mode, but that new Night View mode helps can make a good difference. Night View can be used on both the regular and ultra-wide angle cameras. We don’t have the model with a telephoto camera so we’re not sure if it can be used on the one or not. That new Night View mode is very hit or miss, as its biggest problem is that it’s just not aggressive enough. On the positive side, Night View’s interface is awesome. A dedicated brightness slider makes it easy to add extra brightness to the scene on the fly without having to fuss with settings. This seems to be more of an exposure slider rather than something that adds additional time to the shutter length or raises the ISO, so your mileage may vary with the results. Oddly enough, Night View mode seems to not do much of anything at least half the time. Shots taken with this mode don’t seem to actually use the mode unless the scene is very, very dark. The Ultra-wide angle camera benefits from this the most, and in some cases the difference can be substantial. This doesn’t just mean a brighter scene, it also means improved details. In general though, this mode seems to focus on delivering a crisper scene than auto mode does rather than brightening up the scene, as fine detail is introduced back into the image when switching to this mode. Overall, Night View is a disappointment and doesn’t seem like a good alternative to the Bright mode from previous LG phones, as that mode worked automatically and delivered more of a dramatic change when it was enabled. For a look at all the pictures we took for this review, head on over to the gallery at Flickr.com. The LG G8 ThinQ does an admirable job at most every day tasks, but most certainly excels at a few specific ones. Manual photography and videography have been LG’s strong suit for a while now, and the G8 continues this pedigree. There’s a considerably gulf between LG’s manual camera abilities and that of quite literally every other manufacturer on the market. We’ve been using LG’s phones for the YouTube channel for a year and a half now and absolutely love the experience, especially considering how versitile using something as small as a smartphone for videography can be. 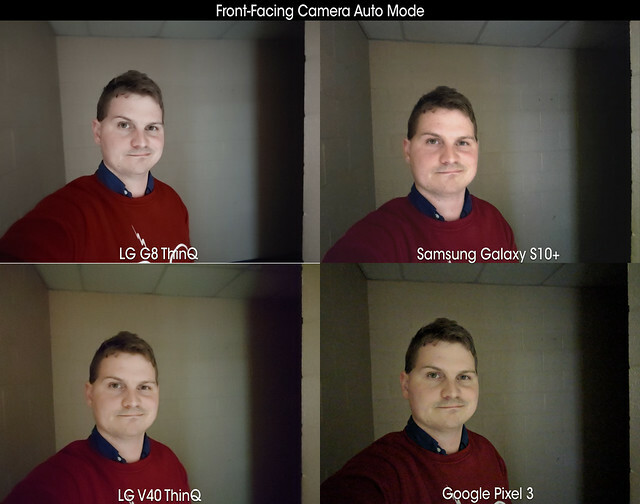 Outside of this, LG’s front-facing camera is easily the best performer in typical lighting conditions, and that’s a huge improvement from every LG flagship in recent memory. Low lighting is one of the G8’s weakest points though, and that includes both the front and rear cameras. This is a particular shame since most phones have begun focusing exclusively on improving low light performance over the past year, and it puts LG behind most other manufacturers by quite a significant margin in some cases.